, of Florence, professor of physic at Pisa, afterwards of surgery and anatomy at Florence, was born there in 1693, and died in 1758, at the age of | sixty-two. In the course of his travels he became the intimate friend of Newton, Boerhaave, and Dr. Mead. The emperor made him his antiquary. He was esteemed both for his theoretical and practical knowledge. He wrote: 1. “Grsecorum Chirurgici Libri; Sorani unus de Fracturarum signis, Oribasii duo de Fractis, et Luxatis, ex Collectione Nicetse, Florent.” 1754, fol. 2. “O ratio de Usu Artis Anatomicse, Florent.” 1736, 4to. 3. “Medicinae laudatio in Gymnasio Pisis habita,” 1727, 4to, spoken on opening a course of lectures at Pisa, where he had been appointed professor, prior to his returning to Florence. 4. “Del vitto Pythagorico,” Flor. 1743, and 1750, 8vo. 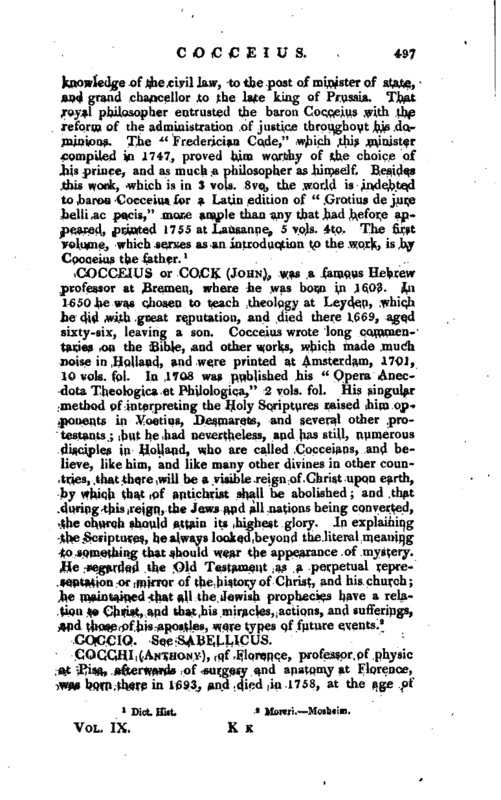 It has been several times reprinted, and in 1762 translated into English. 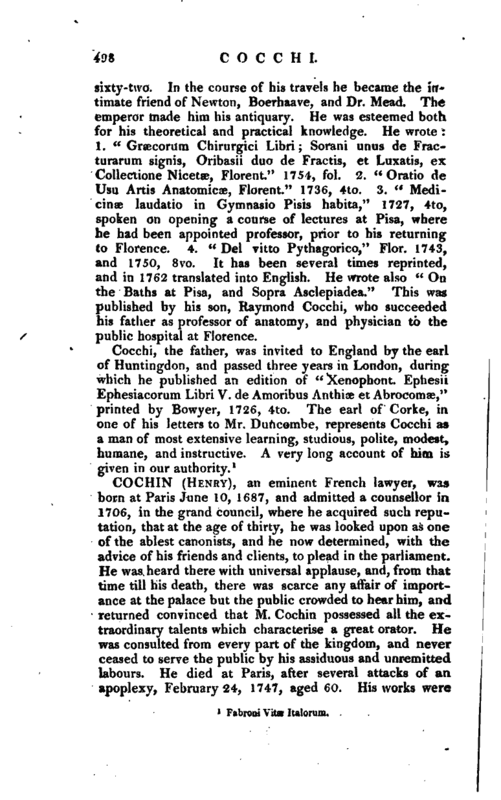 He wrote also “On the Baths at Pisa, and Sopra Asclepiadea.” This was published by his son, Raymond Cocchi, who succeeded his father as professor of anatomy, and physician to the public hospital at Florence.